We were in Washington DC for a long weekend (through Tuesday), and jumped back into the saddle by visiting the Magic Kingdom yesterday. A lot has changed since we’ve been out of town! 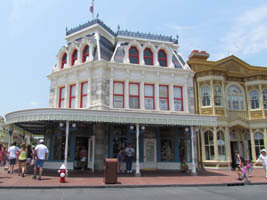 The Main Street Confectionery scrim has been removed, revealing a vibrant red border on a white exterior (below left and right). 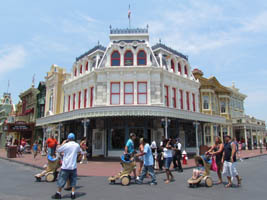 You will see in the video that a portion of the Confectionery that is facing the Emporium (inwards towards Main Street) is now in a pink art-deco style as well.